Biggest, Bestest Farmers Market in Washington! Anita Vizcaya and her daughter Alexandria. Smiling as usual. Photo Copyright by Zachary D. Lyons. On Thursday, March 19, 2015 Anita Vizcaya passed away in her sleep, after a productive day of making candles in the farm house kitchen and going to bed happy. Her family is grateful for the mercy that she left this world peacefully and without pain. Anita was born in Mt Vernon, Washington, and grew up on her parents’ farm, Jessie’s Berries. Located in Skagit County, the farm was named by her father to honor Jessie, Anita’s mother, when they began farming in the late 50’s. Anita took on a greater share of the farming as her parents grew older and the farming became harder for them. And like so many small farmers must, she worked full time in a real-world job too. She retired last year from the Tesoro Refinery, after a long and illustrious professional career. Long after Anita’s Dad passed away, the 3 Vizcaya women worked diligently to keep the berry farm productive. We benefited from their hard work. Their ever present beautiful and infectious smiles were glorious gifts to all the people who came to the market, not to mention the marvelous berries they brought to us each week. Energetic and full of the love of life, Anita’s passion was drawing and painting, which she pursued during the dark and wet winters on Fir Island Rd in Mount Vernon. Anita is survived by her mother, Jessie, her sister, Ofelia, brothers, Alfredo and Javier, son-in-law Daniel, and of course, her daughter Alexandria. Their family was open and loving to each other and so they know that she did not want the family to organize a memorial service. Instead, she insisted they go to Hawaii and enjoy the beauty, warmth, and comfort that Aloha can provide in a time of need. Yet, in her good natured way, she understood that some in her extended family, friends, and co-workers might want to have a recognition of some kind. The family has informed us that they won’t be accepting guests for a while, but if you find yourself going by their farm, they will have a guest book on the front porch for you to share your feelings. We who worked so many years together with Anita at the market, would like to invite her fellow vendors and her customers to join in recognition of the beautiful person that she was, by stopping at the Market Information desk to share memories of her with an entry in the Anita Vizcaya Remembrance Book we will have available there. In lieu of flowers/gifts, it was her wish that donations be made to N.O.A.H. www.thenoahcenter.org. All notes of condolence you wish to leave with us, will be forwarded immediately to Anita’s family. Sunday, August 31st: Ginormous Juicy Melons, Adorable Summer Squash, Charming Cherry Tomatoes, Glorious Gala Apples & Saying Sayonara To Succulents… For Now, Anyway. Succulents in late summer light from Phocas Farms at Ballard Farmers Market. Copyright Zachary D. Lyons. Hey kids! September begins… tomorrow! And that means our buddy, Jimmy, from Phocas Farms, has to retire to his farm in Port Angeles to tend to his saffron crop, which is beginning to spring to life now. So today is your last chance until early next year to stock up on succulents and saffron corms to plant in your own yard. Stop by today, get what you need, and wish Jimmy a happy fall and a bountiful saffron harvest! Ginormous melons from Lyall Farms at Ballard Farmers Market. Copyright Zachary D. Lyons. Lyall Farms has lots of these ginormous, delicious, juicy melons right now at your Ballard Farmers Market. They grow all different kinds of melons, some all too familiar, and others downright strange. But they are all great and just waiting to make a mess out of your best shirt! A rainbow of carrots from Oxbow Farm at Ballard Farmers Market. Copyright Zachary D. Lyons. Oxbow Farm is rocking the carrots right now, in a rainbow of colors. They’ve got ’em white, orange and purple at present, each with their own particular levels of sweetness, some suited best for roasting, while others are best raw. So stop by and get your carrot on now! And if you want to learn more about carrots than you ever thought there was to know about them, check out the World Carrot Museum online, where you’ll learn, for instance, that orange is a relatively new color for carrots. Late summer strawberries from Sidhu Farms at Ballard Farmers Market. Copyright Zachary D. Lyons. Sidhu Farms has a fresh crop of late summer strawberries for you today at your Ballard Farmers Market. Gorgeous, aren’t they? These are from a class of strawberry varieties known as “ever-bearing,” which means they will keep producing blooms and fruit until it gets too cold and dark to do so. Spring varieties are known as “June-bearing,” which means they are naturally genetically preset to bloom and produce fruit for only a specific period of time, usually 10-14 days in and around June, after which they go dormant again until next year. See, aren’t you glad you tuned in to your Ballard Farmers Market blog this week? Baby summer squash from Growing Things Farm at Ballard Farmers Market. Copyright Zachary D. Lyons. Meet baby squash, little summer squash that are so sweet and so beautiful, and the perfect size for sautéing whole. See, Growing Things Farm sorts their summer squash by size — baby, toddler, adolescent… even tiny ones with full blossoms attached — so that you can get the perfect ones for your special meal… which ends up being every meal, when you eat them! Gala apples from Martin Family Orchards at Ballard Farmers Market. Copyright Zachary D. Lyons. These are Gala apples from Martin Family Orchards, just in time for packing in the kiddies lunch bags. (Yikes! Tomorrow is September!) And in case you haven’t noticed, this year has seen the fruit trees of Washington put out record fruit sets of the most delicious fruit ever, earlier than ever. See, global warming does have its up sides. Celery from Boistfort Valley Farm at Ballard Farmers Market. Copyright Zachary D. Lyons. It’s celery season, good people of Ballard! Wait, what? Celery season, you ask? I get it. You still get your celery at the Big Box store, and they have it all year-round. But that celery cannot hold a candle to this celery from Boistfort Valley Farm. This celery is fresh, firm, crisp and, believe it or not, sweet. Yes, sweet. That’s because of its freshness and how it is grown. See, the celery you are getting from the Big Box store was harvested a week or two ago and shipped here from thousands of miles away. This celery was harvested yesterday afternoon in Thurston County. If you have never had farm-fresh celery, you owe it to yourself to try some today. You will never look at Big Box celery the same again! Early Italian prunes from Magana Farms at Ballard Farmers Market. Copyright Zachary D. Lyons. I heart Italian prunes. Yes, prunes. Not plums. These are early Italian prunes from Magana Farms. Prunes are a free-stone stone fruit, meaning they release easily from their pit. They have a denser, sweeter flesh than plums, which are not free-stone, and they take well to cooking and drying, though I love them fresh, too. Of course, the Corporate Agribusiness Yahoos at the California Prune Board would have you believe that these are plums. Why? Because they are about marketing, not about food, and they worry that “prune” is too closely associated with keeping ones bowels regular. And I won’t lie to you… they will do just that. But that should not be a reason to rename them. I mean, why are we so afraid of stuff that is good for us, to the extent we will avoid it even though it is also delicious? How stupid have we become? Well, if you go ask Sam at Pasteria Lucchese what he thinks, he will tell you that he and his fellow Italians are still proud to call these what they really are: prunes! Celebrate them! Eat them! Sauce them! Syrup them! Dry them! Just don’t call them plums! Artichokes from Nash’s Organic Produce at Ballard Farmers Market. Copyright Zachary D. Lyons. Another true love of Italians everywhere (and especially in Italy, for some reason) are fresh artichokes. They steam them. They grill them. They toss them with pasta, make them into soup, put them on pizza. They are crazy for them! If you are, too, now is your time. Get thee to Nash’s Organic Produce with all due haste and enjoy these beautiful artichokes today! Cherry tomatoes from Gaia’s Harmony Farm at Ballard Farmers Market. Copyright Zachary D. Lyons. Gaia’s Harmony Farm has lots and lots of these spectacular cherry tomatoes today! But wait, don’t they just sell berries and juice, you ask? Nope. So come get you some of these wonderful, organic cherry tomatoes today at your Ballard Farmers Market! Artisan breads from Tall Grass Bakery at Ballard Farmers Market. Copyright Zachary D. Lyons. Nothing like a nice, chewy loaf of crusty artisan bread from Tall Grass Bakery to make your meal complete. From pain au levain, a lovely, sour loaf made with whole wheat, to hominy, made with, um, hominy, to their just plain comforting oat and honey bread, Tall Grass has set the standard for great bread in Seattle since their humble beginning with our market organization almost 20 years ago. These organic estate wines come from Wilridge Winery in Madrona. Copyright Zachary D. Lyons. Don’t forget a nice bottle of wine from Seattle’s original winery: Wilridge. These bottles, above, in fact, are their estate wines, made from grapes they grow themselves in the tiny Naches Heights appellation, just west of Yakima in the foothills of the eastern slope of the Cascade Mountains. Stop by their tent for a sample today, then grab a bottle of Washington winemaking history from right here in Seattle to enjoy tonight! A bee enjoying a sunflower from The Old Farmer at Ballard Farmers Market. Copyright Zachary D. Lyons. Let us finish this week’s epistle with this image of a happy little honey bee on freshly cut sunflowers from The Old Farmer, just across the isle from Oxbow Farm at your Ballard Farmers Market. Ballard is home to lots of honey bees, many of which reside atop restaurants like Bastille. And on Sundays, they get to enjoy the wonders of the Market just like you do! There is plenty more local deliciousness waiting for you today at your Ballard Farmers Market. Just check What’s Fresh Now! for a more complete accounting of what is in season right now. Sunday, June 22nd: Happy Summer Solstice! We Bring You Alaskan Salmon, Blueberries, Shunkyo Radishes, 8 Kinds of Summer Squash, A New Bakery & So Much More! Fresh pink salmon from Loki Fish. Photo copyright 2013 by Zachary D. Lyons. Happy Solstice everyone! Yes, today is the first full day of summer! Woohoo! The sun will be up for 16 hours today, with an additional hour of daylight tacked on either side. It’s these spectacular long days that keep us going all winter long, so let’s celebrate. And to get summer started, Loki Fish began catching wild Alaskan salmon this past week, and they will have lots of fresh salmon today at your Ballard Farmers Market! We expect them to have Sockeye, Coho, Pink and Keta today, and possibly even some King. They’ll have fillets and whole fish for you, ready for the grill or smoker. Raspberries, blueberries, blackberries & strawberries from Sidhu Farms. Photo copyright 2010 by Zachary D. Lyons. Holy Berry Cobbler, Batman! Sidhu Farms has raspberries, blueberries, blackberries and strawberries already, and it is still June! All I can say is, wow. This year continues to amaze. So while we begin our slow, steady, six-month long descent into darkness today, let us remember to enjoy all that these long, sunny, warm days have to offer. And heck… start freezing these berries today! You and yours will enjoy them all winter long! Collard greens from Growing Things Farm. Photo copyright 2014 by Zachary D. Lyons. Take a gander at these gorgeous collard greens from Growing Things Farm. Do you eat collard greens? No? Why not? Do you associate them with the kind that is cooked to death with ham hocks in the South? Mind you, I enjoy those as much as the next person, but that ain’t how we roll here in the Northwet. Our collards are so sweet and tender, they are best simply sautéed with some garlic, bacon and a little salt and pepper until just wilted. Toss the stems in first, so they get tender. They make a great side dish to a nice grilled steak, or they can be the centerpiece of your meal. And collard greens are one of the most nutrient dense vegetables you’ll find around here! Pomodoro bread from Snohomish Bakery. Photo courtesy Snohomish Bakery. As you may have noticed, we’ve been one bakery down since the end of May. Well, not anymore! Please welcome Snohomish Bakery, from — you guessed it — Snohomish. They offer a large variety of great artisan breads, including this Pomodoro loaf, which they describe thusly: “A finishing salt takes the flavor of this already-packed savory bread to a whole other level. Ideal for sun-dried tomato and rosemary lovers!” They also offer a number of other fun savory baked goods and croissants. We are excited to add them to our vendor lineup! Organic strawberries from Stoney Plains Organic Farm. Photo copyright 2014 by Zachary D. Lyons. Stoney Plains Organic Farm has great organic strawberries for you this week. And that’s especially good to know, since we’re experiencing a little bit of a dip in our strawberry supply this week. They also have lots and lots of greens available right now. Fresh spearmint from Children’s Garden. Photo copyright 2014 by Zachary D. Lyons. Summertime means that you need mint! Lots of mint. For desserts, cocktails, salads, proteins… pretty much everything, really. Children’s Gardens grows some beautiful mint, including chocolate mint, and this spearmint. Me? I just like crunching up some of the leaves and putting it in my water glass. Saskatoon berries from Foraged & Found Edibles. Photo copyright 2010 by Zachary D. Lyons. Look, kids! Even the wild berries are early this year! These are wild Saskatoon berries from Foraged & Found Edibles. Native to the Pacific Northwest, Western Canada, the Rockies and the North Central U.S., they are nutrient-dense and mighty tasty. Oh, and Foraged & Found has lots of grey morel mushrooms today, too! Fennel from Alm Hill Gardens. Photo copyright 2014 by Zachary D. Lyons. Fennel has arrived at Alm Hill Gardens. This sweet, licorice-y, bulbous weed is so versatile. Use the leafy fronds in salads or on fish. Grill the bulbs, sauté them or pickle them… even eat them raw. Use it to add flavor to other things, or let it be the star. I hear people telling me, “oh, but I’ve got that growing wild in my backyard.” No, what you have in your backyard is a wild cousin. The cultivated form has been bred for its tender bulbs and its sweet flavor. Enjoy! Beef steaks from Skagit River Ranch. Photo copyright 2012 by Zachary D. Lyons. We are full-on into the grilling season now, folks. The kiddies are out of school, the evenings are long and warm, and so much summer produce is great grilled. Plus, you keep your kitchen cool and your cleanup minimal. And with Independence Day just around the corner, you’ll want to stock up on some of these beef steaks from Skagit River Ranch. Their beef is grass-fed and finished on gorgeous pasture up in Sedro-Woolley, and it is tender and delicious. And can’t you just imagine the smell of them wafting through your house as they sizzle over those hot coals? Shunkyo radishes from One Leaf Farm. Photo copyright 2013 by Zachary D. Lyons. These are Shunkyo radishes, a Japanese variety that is my favorite radish. They are long, bright pinkish-red, and right now, they carry a good, spicy kick, which, for my money, every radish should. Stop by One Leaf Farm today, pick some up, and punch up your salad tonight, or simply dip it in some nice butter and maybe some truffle salt for a great pre-dinner snack. Beef-porcini cappelletti from Pasteria Lucchese. Photo courtesy Pasteria Lucchese. Look! It’s a bunch of little hats! No, seriously, this is beef-porcini cappelletti from Pasteria Lucchese, and cappelletti means “little hat” in Italian. So these are a bunch of little hats. Delicious little hats. I am just imagining eating some in a nice broth right now. Mmm. Ask them for ideas for preparing them, or any of his many other awesome handmade artisan pastas, today! Summer squash from Alvarez Organic Farms. Photo copyright 2013 by Zachary D. Lyons. Say what? Yes, this is summer squash from Alvarez Organic Farms. 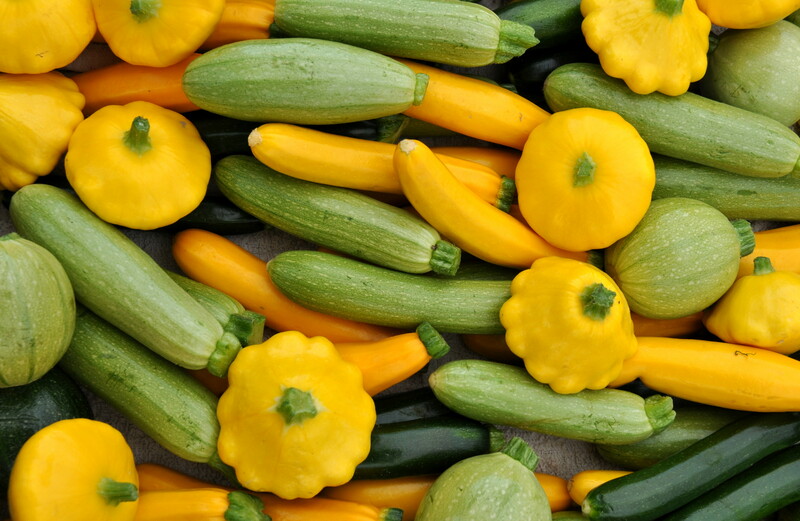 In fact, they already are harvesting at least eight varieties of summer squash over in Mabton… and summer just started! I like to slice them in half, lengthwise, and oil them up, then grill them. How you do like to prepare them? Post your ideas on our Facebook page, or click the comment button, below. Early bing cherries from Martin Family Orchards. Photo copyright 2012 by Zachary D. Lyons. Martin Family Orchards is the most northern of all of the orchardists here at your Ballard Farmers Market. That means they are usually the last to start harvesting cherries. Well, folks. This is the week! They’ll have these lovely Bing cherries, as well as some nice Rainier cherries today. Now, we get to wait on pins and needles for apricots and peaches! Salad mix from Colinwood Farm. Photo copyright 2014 by Zachary D. Lyons. Colinwood Farm blesses us with their wonderful salad mix all year round. But this time of year is when it truly shines. Loaded with many kinds of lettuces, hearty and spicy greens and edible flowers, it is a summer delight! Patty Pan Grill’s market-fresh veggie quesadillas were never sexier. Photo copyright 2014 by Zachary D. Lyons. Da Boyz of Summer are ready to sling you up some serious deliciousness at Patty Pan Grill. Patty Pan embodies farmers market prepared food, being the first to build their menu around what is fresh and local at the market. Their veggies for their quesadillas are all sourced every week from our market farmers, and their tamales are filled with veggies, meats and cheeses from them, as well. And Patty Pan is even a worker-owned cooperative. How cool is that? Enjoy! Please remember bring your own bags every Sunday, as Seattle’s single-use plastic bag ban is now in effect. Also, please take note of our new green composting and blue recycling waste receptacles throughout your Ballard Farmers Market, and please make an effort to use them correctly. Each container has what’s okay to put in it pictured right on the lid. Please do not put the wrong materials in, because that drives up the cost of recycling and composting, and it can result in the entire container being sent instead to a landfill. Your understanding and cooperation are appreciated. Sunday, June 15th: Happy Father’s Day, Dad! For You: Fava Beans, King Salmon, Raspberries, Sausages, Olive Fougasse, Local Beer & A New Shaving Kit! My dad enjoying chicken pie at the Bryant House in Weston, Vermont in 2006. Photo copyright 2006 by Zachary D. Lyons. I bring this up on this Father’s Day 2014 not only to honor my own father, but to encourage you to try to make the best of today, and any day with your dad, because you probably don’t know him as well as you think you do. Fresh, Washington coastal red king salmon from Wilson Fish. Photo copyright 2011 by Zachary D. Lyons. You know what any dad would love on Father’s Day? A nice piece of Washington king salmon from Wilson Fish on the grill, that’s what! Throw a few fava beans on with it (see below), get some good bread and berries, maybe a nice salad, and you are good to go! Speckled Amish lettuce from One Leaf Farm. Photo copyright 2014 by Zachary D. Lyons. Here is yet another of the gorgeous, and delicious, varieties of heirloom lettuce grown by One Leaf Farm. This is Speckled Amish lettuce. If you grew up on boring iceberg lettuce from Arizona, you might think all lettuce is boring. It is not. There are countless kinds of lettuces, suited to many different applications. They run the gamut from sweet to earthy, from delicate to sturdy, from huge to tiny… all just in the varieties One Leaf Farm offers. They make for great salads, lettuce wraps, sandwiches. Some are awesome grilled. Pick Rand’s brains about the different kinds they have from week to week, and experiment to find out which ones you like best! Organic raspberries from Gaia’s Harmony Farm. Photo copyright 2014 by Zachary D. Lyons. I remember picking raspberries right off the vine in our backyard as a kid. My dad, the farm boy, always had a garden. In fact, he still does in pots on his deck in Bellingham. But since I can’t get up there today to visit with him, I’ll call him, and then I will live vicariously by enjoying some of these amazing organic raspberries from Gaia’s Harmony Farm. These beauties are incredible! Fresh fava beans from Alvarez Organic Farms. Photo copyright 2011 by Zachary D. Lyons. Apriums from Tiny’s Organic Produce. Photo copyright 2014 by Zachary D. Lyons. Tiny’s Organic Produce has its first harvest of cherries and apriums this week your Ballard Farmers Market. The cherries are Bings and Rainiers, and the apriums are a hybrid of apricots and plums, genetically 70% apricot and 30% plum. They favor apricots in appearance and flavor, though they are sturdier, making them good for hikes and lunch boxes, and they are the first large stone fruit of the season. Rainbow chard from Oxbow Farm. Photo copyright 2011 by Zachary D. Lyons. Make sure pa gets his greens today. Stop by Oxbow Farm for some collard greens, some dino kale or some of this beautiful rainbow chard. Because a dad full of deliciousness, vitamins and ruffage is a happy dad! Fresh sausages from Sea Breeze Farm. Photo copyright 2011 by Zachary D. Lyons. Or… perhaps dad would like some nice sausages on the grill, like these from Sea Breeze Farm. They have something like 13, 527 kinds of sausages, or nine. Something like that. But whatever the number, you will find at least one that will make dad smile. Fougasse from Tall Grass Bakery. Photo copyright 2011 by Zachary D. Lyons. A nice loaf of olive fougasse from Tall Grass Bakery will make dad grin today! Or any of their other breads and baked goodies. I love this bread so much, I can eat an entire loaf in a single sitting! Heck, hand dad some fougasse, a cold one, and a bowl of sugar snap peas, and direct him to the nearest lawn chair. Happy dad, indeed! Strawberries from Jessie’s Berries. Photo copyright 2013 by Zachary D. Lyons. My folks are harvesting the first of their strawberries from their deck garden this weekend, and so is Jessie’s Berries! In fact, Jessie’s will be joining us here at your Ballard Farmers Market for the first time this season. It’s time to eat ourselves silly on some Fir Island sweetness! Vanilla rice pudding from Pasteria Lucchese. Photo copyright 2012 by Zachary D. Lyons. When I was knee-high to a grasshopper, I never understood why my dad was so crazy about rice pudding. Chocolate pudding I understood. But rice? I thought rice was for frying with shrimp at the Kingston Tea Garden. Alas, in my adult years, as my taste buds matured (yes, one part of me did), I began to develop a taste for rice pudding myself. Then I met Sam & Sara Lucchese of Pasteria Lucchese, and I tasted their vanilla rice pudding. Yes, this is the food of the gods, and now, I share yet one more thing with my dad: a madness for this stuff! Belgian-style ales from Propolis Brewing. Photo copyright 2014 by Zachary D. Lyons. Ballard is Beer Central here in Seattle, but did you know that your Ballard Farmers Market is host to the first ever brewery at a farmers market in Seattle? Yup. Propolis Brewing makes wonderful, bottle-aged, Belgian-style ales in Port Townsend from lots of local ingredients, and they offer them to you right here. Their flavors change with the season, like everything else around here. Stop by and pick some up for dad! Shaving kit from Brown Butterfly. Photo copyright 2010 by Zachary D. Lyons. If you’re going to get dad a shaving kit for Father’s Day tomorrow, get him one of these from Brown Butterfly at your Ballard Farmers Market! It’ll keep Dad’s face smooth and soft, it treads lightly on the environment, and it will be a gift that comes with a face and a story behind it. Paella and casserole pans from BluSkillet. Photo copyright 2013 by Zachary D. Lyons. And for the dad who has everything, I bet he doesn’t have a hand-forged steel pan from Blu Skillet Ironware. If your dad cooks at all, he will adore one of these pans. I use my 10-inch skillet for about 70% of my cooking these days. It dispenses uniform heat, remains perfectly seasoned for gorgeous browning and no sticking, cleans up easily, costs no more than one of those highly-rated pans in those whoopdeedoo cooking magazines (and probably less), and it is made right here in Ballard!!! Now, that is a gift that means something. Camelina oil from Ole World Oils. Photo copyright 2013 by Zachary D. Lyons. And I finish off this week’s Father’s Day edition of most things Ballard Farmers Market with camelina oil from Ole World Oils, grown and pressed just over in Ritzville, Washington. This is our local oil, folks. Camelina is an ancient member of the mustard family, and it’s seeds have been pressed for cooking oil for centuries. It is non-GMO, has a higher smoke point (475 degrees) than grape seed oil, is loaded with Vitamin E, making it both shelf stable and nutritious, is high in omega-fatty acids, with a perfect 2:1 ratio of omega 3 to omega 6, has a great flavor and a gorgeous viscosity, is good for high-heat cooking and as a finishing oil, and it is priced competitively with the average olive oil from far away. And I have found that it is the perfect seasoning oil for my Blu Skillet pan. I rub a little into my pan each time after cleaning it.